First used militarily in January, 1943 off the carrier USS Essex with VF-9, the Hellcat became the U.S. Navy's most important fighter of World War II, credited with nearly 75% of ALL naval air-to-air combat kills. Although the Hellcat couldn't claim any records for speed, maneuverability, firepower, or endurance, its incredibly strong airframe helped it earn a kill-to-loss ratio of better than 19 to 1. The aircraft began its career on August 31, 1943 and was operational for only two years. During that time it succeeded in shooting down a remarkable number of enemy aircraft. Out of a total of 6,477 enemy planes destroyed by carrier-based pilots, no fewer than 4,947 fell to earth under the Hellcats' fire. This figure increases to 5,156 if you include the victories scored by Hellcat pilots that were land based and those serving in the U.S. Marine Corps. thereby scoring nearly 80% of the kills scored; a 19 to 1 ratio. 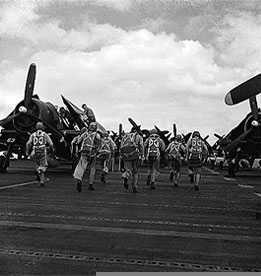 Some 12,275 Hellcats were built and, along with Chance-Vought's Corsair, became standard Navy equipment for the duration of the war. The Hellcat was so successful that the only substantial wartime modification was the addition of a 150 gallon drop fuel tank to extend its range. The project was developed by Grumman in order to build a successor to the F4F "Wildcat". The contract for two prototypes was signed on June 30, 1941. The program went forward very quickly and the first prototype designated XF6F-1 took to the air on June 26, 1942. The aircraft was a large all-metal low-wing monoplane with retractable landing gear and arrester hook. It was fitted with a 1,700 hp Wright R-2600-10 engine and within one month later the second prototype with a more powerful Pratt & Whitney R-2800-18 engine. From the second prototype designated XF6F-3 the first production series aircraft were born. This version began leaving the assembly lines at the beginning of October 1942. The installation of this more powerful engine proved decisive for the future success of the Hellcat, in that it allowed it to absorb the notable weight increase created during the course of production without any substantial reduction in performance. The first F6F-3's were assigned to the aircraft carrier Essex on January 16, 1943, and on August 31, 1943 to the carriers Yorktown and Independence. The F6F-3's first engagement with the enemy took place when VF-9 (Essex), VF-5 (Yorktown), and VF-6 and 22 (Independence) struck at the Japanese base on Marcus Island. In the meantime, production was going ahead at a steadily accelerating pace that exceeded 500 aircraft per month. During 1943, 2,545 aircraft were delivered. 252 of these went to the British Fleet Air Arm that called the F6F-3 the Hellcat Mk. I and put them into service in July. In all, 4.403 of the dash threes were produced, and 205 of these were equipped as night fighters and designated F6F-3E and F6F-3N. 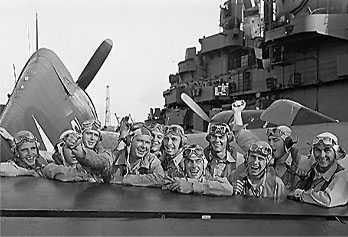 F6F pilots scramble to their planes on the flight deck of the USS Hornet (CV-12) for a raid on Japanese shipping in the China Sea. On April 14, 1944 the first F6F-5 version of the Hellcat took to the air. 7,870 of this production version were built, of which 932 were given to the British Navy. The dash five differed from the previous version in its engine a Pratt & Whitney R-2800-10W with water injection to increase power in the case of emergency and heavier armament, which eventually included a maximum bomb load of 2,000 lbs (907 kg) of bombs. A series of F6F-5N night fighters were also produced with 1,434 being built in all. Production of the Grumman F6F Hellcat ceased on November 16, 1945. Postwar, F6F's remained inUSN service until 1959. The Blue Angels began with the Hellcat. The 3rd highest scoring U.S. ace of WWII, Cmdr. 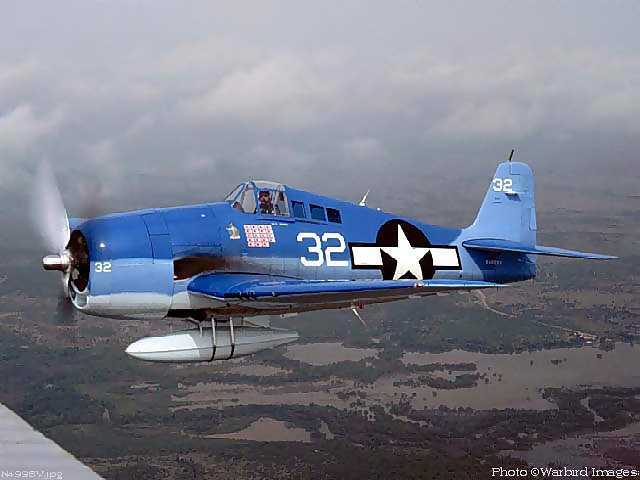 David McCampbell ( 34 kills ) and winner of the Congressional Medal of Honor, flew an F6F-5 Hellcat. The Quonset Air Museum's (North Kingstown, R.I.) Grumman Hellcat is U.S. Navy Buno.70185. The Aircraft was recovered by QAM in December, 1993 off the coast of Martha's Vineyard, MA. It has been discovered that The Hellcat was assigned to NACTULANT (Night Air Combat Training Unit atLANTic) which was headquartered at NAAF Charlestown, R.I. According to Navy Crash records, this F6F was on a familiarization flight out of NAAF Westerly, R.I. on April 3, 1945. The aircraft was one of seven aircraft on a ground control intercept flight. The aircraft were in the vicinity of Nantucket Sound when the Pilot, Ensign Vincent A. Frankwitz, USNR, radioed a loss of oil pressure. He was ordered to turn towards Martha's Vineyard where there was a small Navy Auxilary landing field. he decended rapidly to below the 600 foot overcast and at this point his wingman noted that Frankwitz's engine seized. The aircraft appeared to make a successful ditching and Ens. Frankwitz was seen to exit the aircraft. The aircraft sank in approximately one minute. Ens. Frankwitz was sighted several times in the water in the midst of the oil slick before his wingman was orderd back to base. Ens. Frankwitz was never rescued. The Water Temperture was 42 degrees. This Grumman F6F-5 Hellcat will be dedicated and restored in his memory. This particular Hellcat is an early production F6F-5 that retains the small windows behind the cockpit. 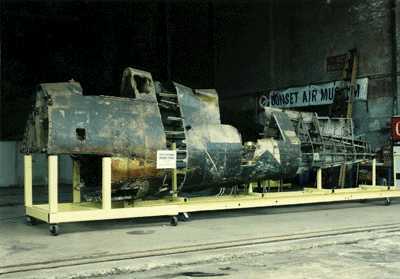 Of the 7,869 F6F-5 Hellcats produced, only 1,404 were built before the rear windows were deleted. Note: The aircraft can be seen at the Quonset Air Museum, Quonset State Airport, North Kingstown, R.I.
Also, please visit the web site of the USS Saratoga Museum Foundation for information on the progress of the Air, Land & Sea Heritage and Technology Park which the foundation envisions for the Quonset Point area. Ens. William J. Seyfferle, Ltjg. Alfred L. Frendberg, Lcdr. Paul D. Buie, Ens. John W. Bartol, Ltjg. Dean D. Whitmore, Ltjg. Francis M. Fleming, Ltjg. Eugene R. Hanks, Ens. E.J. Rucinski, Ltjg. R.G. Johnson, Ltjg. Sven Rolfsen. Length: 33 ft. 7 in. Wing Span: 40 ft. 10 in. Wings folded: 16 ft. 2 in. Max Take-off Weight: 15,413 lbs. Six .50 in. machine guns, and up to 2000 lbs of ordinance. Power: 2000 hp. Pratt & Whitney R-2800-18 Double Wasp 18 cylinder air-cooled radial. Max. Speed: 380 mph. at 23,400 ft.